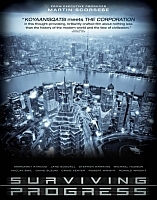 From executive producer Martin Scorsese and screened as part of the DocHouse strand, Mathieu Roy and Harold Crooks’ documentary Surviving Progress (2011) is a fascinating and highly ambitious evaluation of ‘economic progress’, questioning whether the term always necessary means improvement in a world of rapidly evolving technologies and increasing global debt. Inspired by Ronald Wright’s book A Short History of Progress, the documentary presents a careful and balanced exploration of a complex paradox; if increasing wealth is deemed progressive, what has actually brought us to the near-collapse of the global economy? The documentary begins with past examples of previous civilisations and the concept of ‘progress traps’. This term, coined by Wright, suggests that ancient civilisations such as the Roman Empire reached a point of critical mass, ultimately leading to their demise. The crux of the problem presented is that day-by-day, first world countries such as the US and UK draw on both fiscal and natural resources at an alarming rate, at the expense of less economically-developed nations. Unlike previous civilisations, ours is a global system complexly intertwined through commerce – if the system breaks down, the whole world suffers on a scale never before seen in human history. The ‘progress problem’, which of course is only a theory, is debated in an effective and entertaining light. Such worrying ideas could easily come across as scaremongering, but Surviving Progress strikes an impressive balance between making audiences aware of this potentially crippling problem without resorting to the types of scare tactics that so often populate this style of documentary. Graphics and CGI scenes have been carefully inserted between interviews from some of the brightest minds across various fields, including author Margaret Atwood, primatologist Jane Goodall and physicist Stephen Hawking. Each ‘great mind’ thoughtfully considers the problem of how humanity will cope with such exponential growth, and the consequent rapid drain on our resources. Importantly, the issues explored, which range from the destruction of eco-systems in Brazil to the mortgage lending crisis in America (which we are now paying the price for), concern all societies across the world given equal time to both rich and poor. The nuanced arguments of Surviving Progress cannot be adequately explored within this review, but suffices to say that Roy and Crook’s documentary is one of the finest to date, giving a chilling, yet sensible exploration of issues that affect us all. For more info about DocHouse Thursdays, visit dochouse.org.